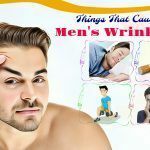 Hair loss affects both men and women. Many people suffer from the problem of hair loss due to hormone imbalance, aging, stress, illness, poor diet, and treatment for illnesses. They often use expensive products to get a healthy, styled and strong hair. However, these products contain a tone of harmful chemical that may damage hair. So, how to promote hair growth safely and naturally? Using essential oils will help you combat hair loss and enhance hair growth without damaging hair. 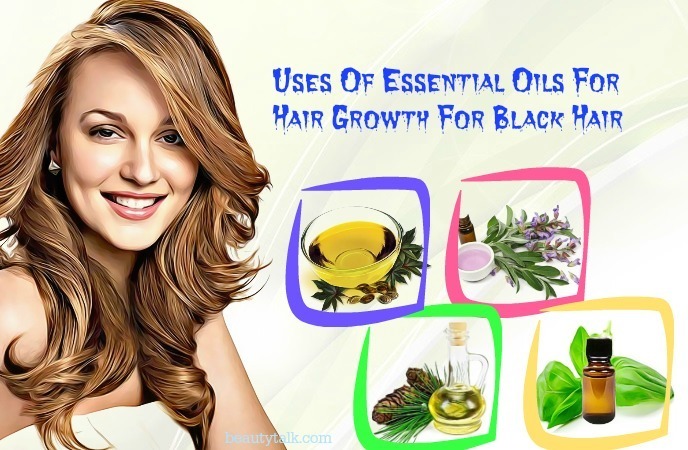 In this post, we, Beauty Talk will tell you about benefits of 14 best essential oils for hair growth, thickness, shine, and for black hair. Plus, we also add the specific ways to use them at home. Read on to discover more. Essential oils are liquids that are derived from different plants. They have the undiluted, pure compounds giving the plants their distinctive fragrances. So, they are often used in producing perfumes and perfume oils. 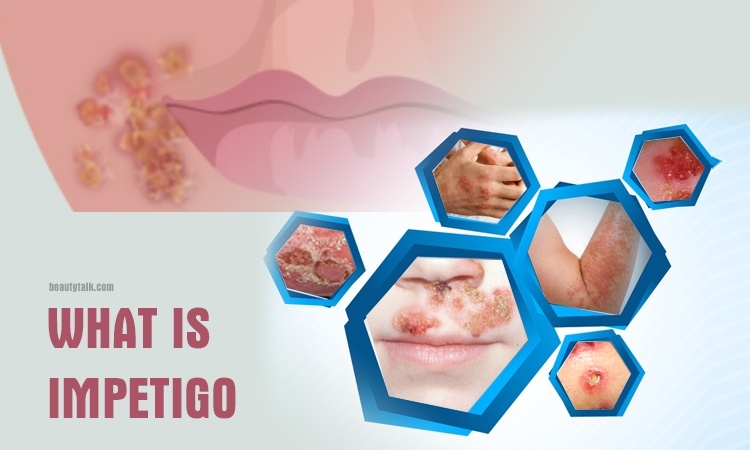 Besides, they also have many medicinal properties which are beneficial for health and beauty. Dealing with hair loss is one of the top beauty benefits of essential oils. Many oils contain a stimulant, antibacterial, emollient, anti-inflammatory, and antioxidant abilities, all of which aid in stimulating hair growth and protecting the hair from breakage. They are useful in treating scalp infections causing dryness, hair loss, dandruff, and itching. Plus, they help to moisturize and strengthen damaged and dry hair, and prevent split ends. They additionally draw nutrients to the hair follicles by boosting the circulation of blood in the scalp. 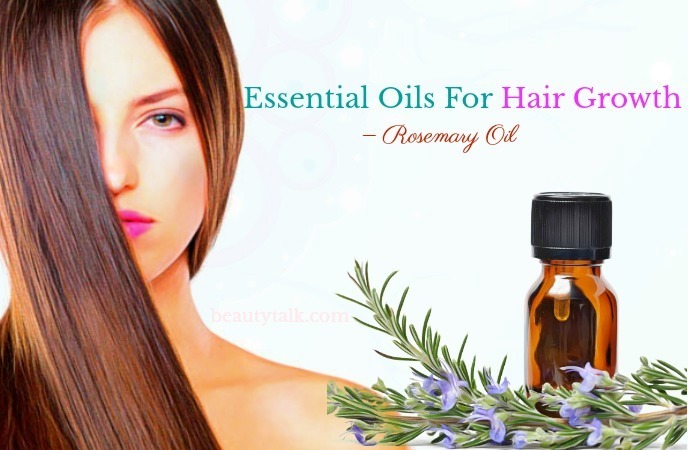 Rosemary essential oil is excellent for enhancing faster hair growth. It can fight against graying and thinning hair due to its antioxidant properties. The antioxidants also help to encourage the circulation of the blood of your scalp. Furthermore, it is also useful in enhancing sebum production and opening up the clogged pores, which lead to acne and itchy scalp. Last but not least, this oil can treat flakiness, dandruff, and other scalp issues by providing comfort to your itchy scalp. In fact, regular use of this oil is famous for promoting hair growth and thickness and combating the itchy scalp. Prepare 10 drops of rosemary oil along with 3 tablespoons of olive oil. Warm the olive oil and mix it with the rosemary oil. Use this resultant mixture to the scalp and hair. Keep it on for sixty minutes and wash off with shampoo. Follow it regularly to get achieved thickness, shine and hair growth. Chamomile oil is non-greasy and has remarkable medicinal effects. It comes with anti-inflammatory, anti-septic, anti-itching, and anti-allergic characteristics, which all are essential in battling dry scalp, scalp acne, eczema, hair loss, itchy scalp and dandruff. Plus, it also holds anti-inflammatory properties that work well on eliminating a sensitive scalp. It also makes hair soft and shiny by conditioning it. It also protects hair from pollutant elements and offering it a great shine. For hair rinsing, take one quart of water and ten drops of chamomile oil. Then, add the oil to the water. Wash your hair thoroughly and use this mixture as a final rinse. To condition the scalp, get several drops of chamomile essential oil along with one tablespoon of jojoba oil. Add the oil to the jojoba oil and mix well. Massage the scalp with this mixture. Wait for a couple of before washing off. Lavender essential oil comes with many medical properties. It also possesses natural antiseptic and antimicrobial abilities, which can soothe scalp problems and treat the irritated scalp. These agents also help to curb scalp acne and dandruff. This oil additionally balances the sebum production, encourages blood circulation to the scalp and thus facilitates healthy hair growth. It further moisturizes the scalp and nourishes the hair at the roots. Along with that, the sweet relaxing scent of this oil can lower stress and anxiety which are two factors for hair loss. Take ten drops of lavender oil and one tablespoon of coconut or jojoba oil. Mix these oils well and massage the scalp properly. Wait for several hour or overnight. Afterward, wash it off using shampoo. 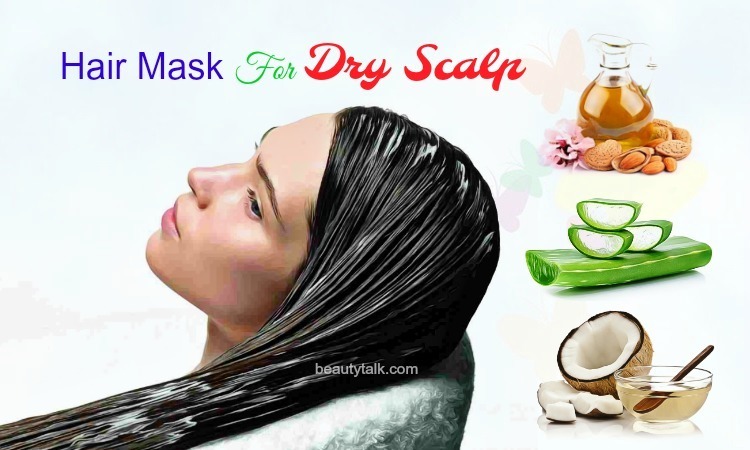 Are you suffering from dry, flaky scalp? Do you want to promote healthy hair growth? You should pass thyme essential oil because it can improve blood circulation and facilitate hair follicles, thus making hair grow fast. 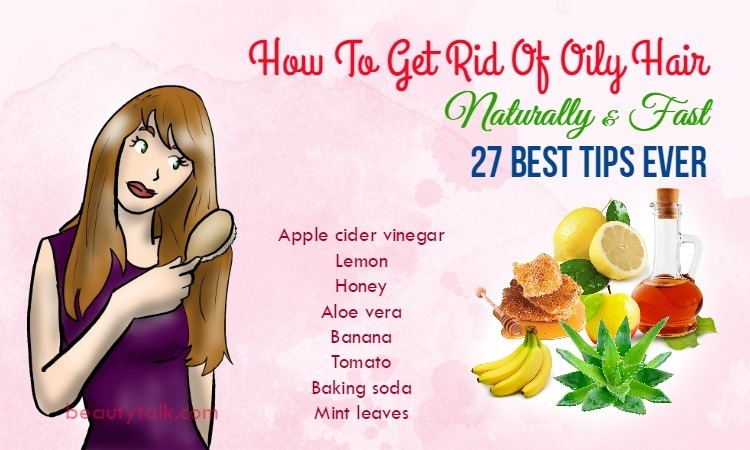 This oil is also a primary ingredient used in shampoo as well as other hair products. Plus, it’s used in aromatherapy to take control of stress-induced hair loss. Using this oil also aids in treating dandruff and other scalp troubles owing to its antimicrobial properties. Simply mix thyme oil (two drops), extra virgin olive oil (two tablespoons) and lavender oil (five drops). Use this mixture to massage your scalp slightly. Keep your application on for fifteen minutes and wash with shampoo. 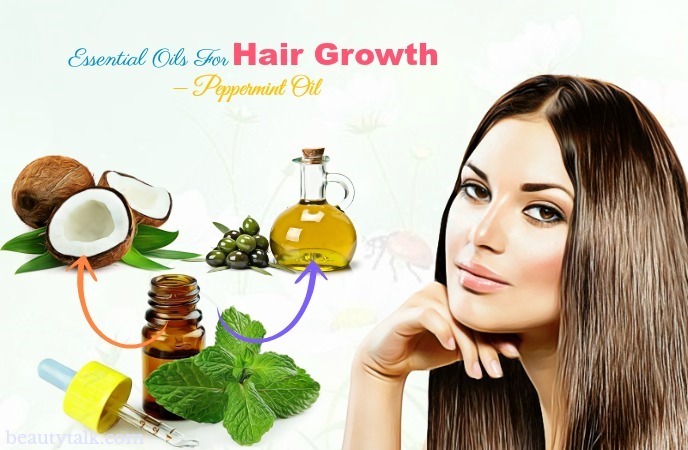 According to a research, peppermint essential oil can stimulate the scalp and enable healthy hair growth & thickness. It is useful for stimulating blood circulation, which eventually facilitates the new hair growth. It also gives a relaxing and cooling sensation to the body, thereby preventing stress induced hair loss. Plus, the cooling agents found in it help to calm the irritated scalp. Furthermore, this oil also owns the antiseptic properties that are beneficial for treating head lice and dandruff. You combine five drops of peppermint essential oil with four drops of lavender essential oil. To this oil mixture, add two tablespoons of warm coconut oil. Blend everything well and apply to the scalp while slowly massaging it. Wash off with the support of shampoo after 20 minutes. This oil is known for its numerous therapeutic agents that are ideal for fighting hair loss and dandruff. It also stimulates hair growth by activating hair follicles. Plus, the anti-microbial abilities in the oil can protect the scalp from bacterial and fungal infections. When applied topically on your scalp, this oil helps to eliminate stress and anxiety causing hair to fall off, as it consists of a soothing and calming effect. Take two drops of cedar essential oil and add it in two tablespoons of coconut oil. Mix these things well and massage into the scalp. Wash it off after 3 hours with shampoo. Alternatively, add about five drops of this oil in 1 tablespoon of your shampoo. Wash your hair with this mixture. Ylang Ylang oil works well on stimulating hair growth. It can accelerate the hair follicles and relax tight scalp, thus curbing hair loss. Also, it helps to balance the oil secretion from sebaceous glands, making it ideal for the dry, dull and oily scalp. It also keeps the scalp healthy and clean since it composes of antiseptic and tonic effects. Firstly, warm two tablespoons of coconut or olive oil. Next, add about five drops of ylang-ylang essential oil to it. Start massaging this mixture into the scalp. Then, use a warm moist towel to cover the scalp. After several minutes, wash with shampoo. This oil is extracted from lemon peels and is light and zesty. It embraces the drying agents, which is ideal for oily scalp treatment. It further combats dandruff and deals with acne prone scalp. This oil also comprises the antiseptic and antimicrobial properties, which can inhibit the scalp from infections. In fact, all these activities guarantee proper health to the scalp and accelerate the healthy hair growth. Mix five drops of lemon oil with two tablespoons of jojoba oil. Then, apply it all over the scalp and hair. After 1 to 2 hours, shampoo your hair as usual. The oil contains compounds that are ideal for balancing hormones and relieving stress. Therefore, it helps prevent hair loss caused due to stress. 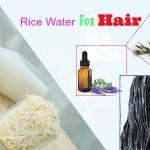 Besides, it can also regulate the production of sebum on the scalp which helps protect it to facilitate healthy hair growth. It additionally owns the phytoestrogens, which are useful for promoting the hair growth. Combine one teaspoon each of clary sage essential oil and jojoba oil. Gently massage the oil mixture on your whole scalp. Wait for around 30 minutes before washing with a mild shampoo. Carrot seed essential oil is excellent for keeping the scalp nourished and improving the circulation of blood to contribute to hair growth. Plus, the essential vitamins and beta-carotene in the oil can minimize the problem of hair fall. It also strengthens the roots of the hair and helps it grow thicker. It also makes the hair shine and maintains it healthy. 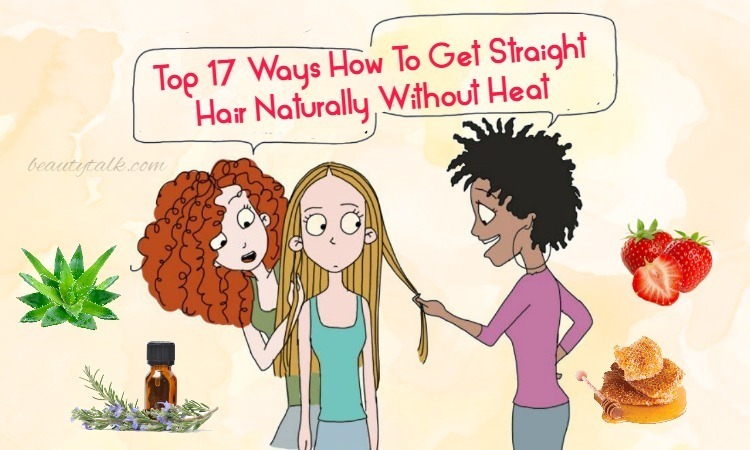 Also, it conditions the hair and prevents breakage and split ends as well. Mix four drops each of carrot seed oil and frankincense essential oil. Then, to the oil mixture, add four tablespoons of warm coconut oil and blend them well. Begin applying all over the scalp and hair. Keep it on for some minutes and use shampoo to wash off. This oil is effective in improving the circulation of blood, thereby helping reducing hair fall. It also grows well pigmented black hair by promoting hair follicles and melanocytes. It is also ideal for reducing the hair thinning and different forms of alopecia. Plus, it can relax the sebaceous glands to balance the sebum production of the scalp. A key necessity of healthy hair growth is balanced sebum production. 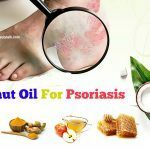 Besides, the oil also has natural antifungal and antibacterial characteristics, which all work well in treating the problematic scalp. Furthermore, this oil is also beneficial for fighting with dandruff and relaxing the irritated scalp. Prepare 3-4 drops of cedarwood oil and two tablespoons of olive oil. Mix these components well and apply it all over the scalp while massaging slowly. After that, wash it off after 10-15 minutes. This oil has a pungent, fresh smell and comes with incredible medicinal agents. 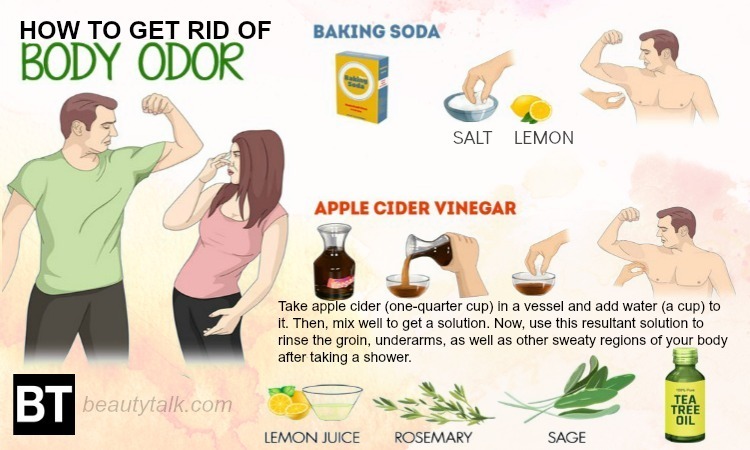 It can help purify the scalp and treat dandruff problem. It further balances the oil production and protects the scalp from harmful intrusions. It prevents hair loss by improving the scalp’s condition and keeping the pores clean. Moreover, it can facilitate the hair growth by nourishing the roots of the hair. Mix 3 drops of tea tree oil with two tbsp of sweet almond oil. Then, blend the elements well and start applying to your scalp. After that, shampoo out after 30 minutes. Basil essential oil is found in conditioners and shampoos designated for remaining a healthy scalp. It accelerates hair growth by promoting blood circulation. It’s also rich in antioxidants that protect your hair from free radicals and UV rays. You combine ten drops of basil oil with five drops of lavender essential oil and mix it with four teaspoons of coconut oil. Massage into your scalp slightly and cover by using a plastic cap. Wait for thirty minutes and rinse and style as normal. Sage is a traditional remedy for graying hair and promoting new hair growth. 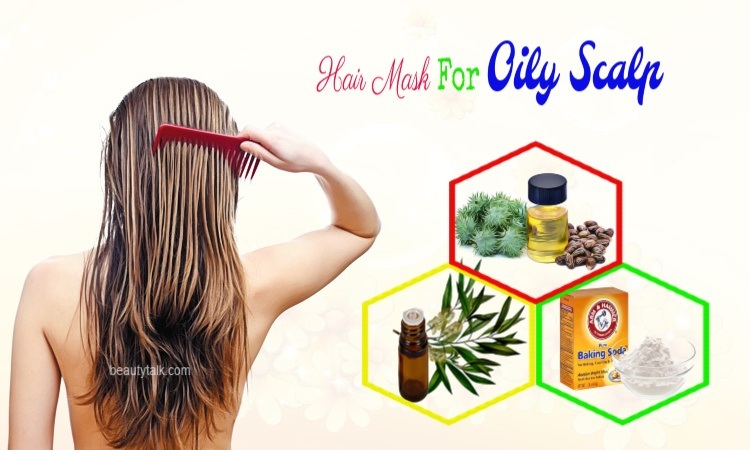 It is full of antibiotic, antiseptic and anti-allergic properties, as well as zinc, potassium, magnesium, and vitamins B and C. Sage oil is also helpful for clarifying the scalp. Plus, it provides the healing properties to scalp conditions like psoriasis. It additionally aids in cleansing impurities and dirt out of the scalp. Prepare one tablespoon of dried sage leaves and pour one cup of boiling water over it. Let this mixture cool and then use a coffee filter to strain it. After that, wash and rinse the hair as normal. Use this sage tea as a final rinse. 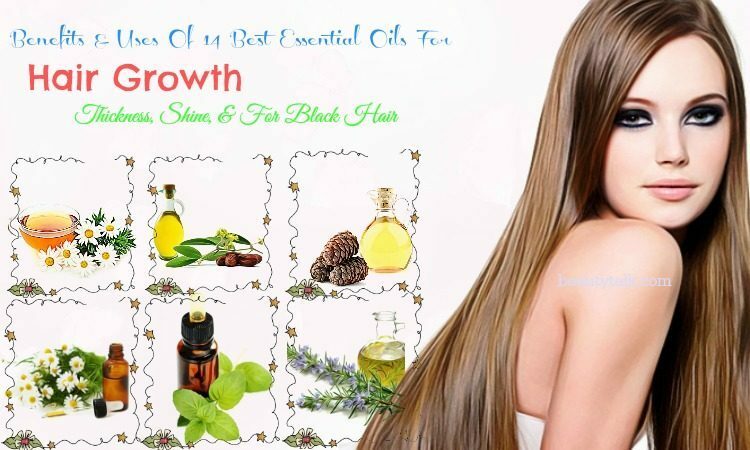 Using essential oils for hair growth is famous in the world. But certain essential oils can result in discomfort and inflammation for people with sensitive scalp and skin. However, most of the oils are possibly safe when properly diluted or used in moderation. Before using essential oils for hair growth, don’t forget to check with your doctor. 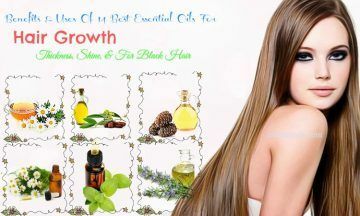 In fact, all the essential oils for hair growth listed below help cleanse the hair, prevent dandruff and irritation, and enhance blood circulation. 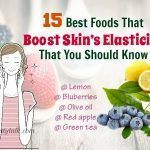 If you want to read more other articles related to hair, please visit our Foods For Beauty page. Also, if you know other uses of essential oils for hair growth, thickness, shine, and for black hair, then share with us. 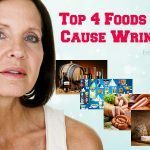 13 Unexpected Foods That Cause Acne – Stop Eating Before Reading The Article! Top 13 Beauty Benefits Of Buttermilk On Skin & Hair – How To Apply It? Top 13 Beauty Benefits Of Aloe Vera For Hair, Skin – How To Use? 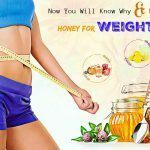 Now You Will Know Why & How To Use Honey For Weight Loss?